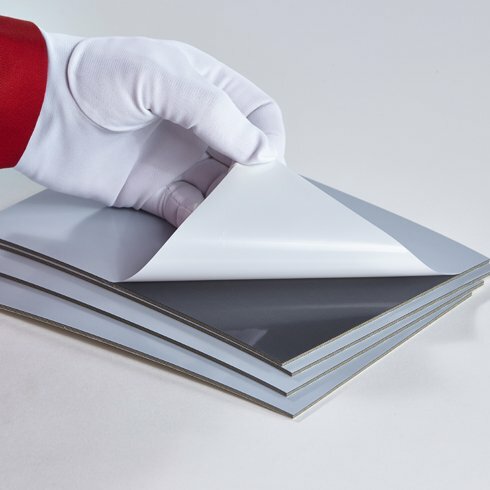 The Folacomp range was specifically developed for use underneath Folacoat coating plates and offers a wide range of thicknesses of underpacking containing a high percentage of compressible components. The content of smash-sensitive fabrics is considerably reduced in comparison with conventional compressible rubber underpacking blankets. The large number of thicknesses available makes it possible to use just one layer of underpacking in combination with the respective Folacoat coating plate. Packings made up of several sheets of paper belong to the past. 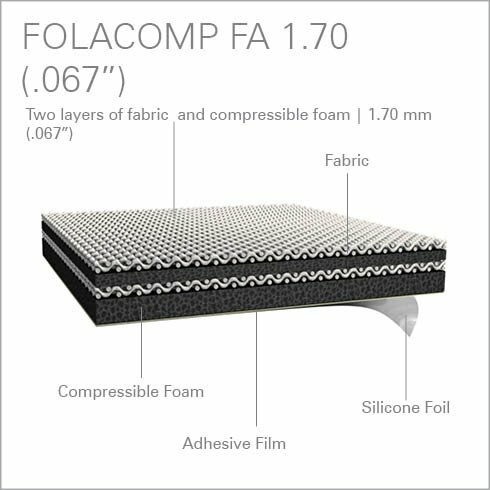 The Folacomp FA is a compressible, self-adhesive version of our flexible Folacomp F underpacking. Before mounting the underpacking on the cylinder, please make sure, that the cylinder is clean and free of contamination such as dirt and grease. Folacomp FA is applied to the lead or tail edge of the forme cylinder in accordance with the type of coating unit. Peel back approx. 30 cm (11.81”) of the silicone backing paper from the adhesive film. Carefully place the sheet alongside the edge of the cylinder, apply pressure from the middle of the sheet to both sides and make sure that no air bubbles are trapped. Working this way guarantees a perfect adhesion around the cylinder. We recommend to install a coating plate on the cylinder directly after the Folacomp FA was mounted, as this will ensure a good contact of the adhesive to the cylinder. The material tends to sink about 0.04 mm (.0016”) after a period of about 5000 printed sheets.